My interest in interesting Italian beer is fairly well documented on here (Baladin, Amarcord, Lambrate, Elav & Amiata so far, with a few more bottles on the shelf waiting to be drunk), so the chance to pounce on a Real Life Italian brewer making interesting beer was something that I was rather happy to presented with. It was made significantly easier by the fact that Bruno is a thoroughly nice chap who likes to talk about the interesting things that he and the other folks in Italy are doing. They started the brewery back in 2008 with a 550 litre brew kit and despite expanding over the last 5 years they’re still only producing comparatively small amounts of beer. As such they don’t get too far outside of Italy and as yet there isn’t a reliable way of getting his beers in the UK. They’re based in Fidenza in the north of the country, near to Parma, an area with a lot of good food and drink. Just from looking at Google maps I know a number of the towns thanks to various tasty things they produce – Parma (ham), Modena (Balsamic vinegar), Reggio Emilia (Parmesan – Parmagiano-Reggiano can be translated as ‘from Parma/Reggio-Emilia’) and Bologna (many things, although, as St Heston has taught me, probably not British-style Spaghetti Bolognese). 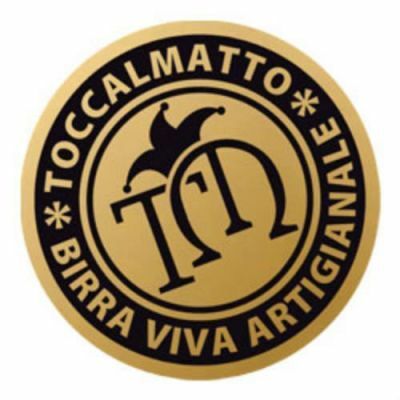 It seems that if you want to go on holiday to eat and drink tasty things then you can do a lot worse than popping over to see the folks at Birra Toccalmatto. They’ve got quite a big beer range, with seven listed in their regularly produced ‘classic range’ as well as three seasonals, and Bruno brought us over a few interesting things to try. 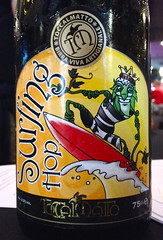 On the nose it had a good malty base with lots of fruit on top – peach, apricot and honeydew melon – and resiny undertones. To taste it started with a hint of soapiness, which was quickly hidden by sour hops and pine needles. On top of that the melon from the nose still came through, along with sour orange peel, spicy pine resin and pine needles. It finished with mixed sour fruit and some creeping green hops. Very much a beer that sits in with my current hop-loving palate – nice and bitter with some great fruit on the nose. Next was the Salty Dog, a barley wine aged in whisky barrels. On the nose there was mulchy fruit, intensely sweet malt and Marmitey umami. To taste it was very sweet and syrupy with stewed peaches and apricots as well as a splash of salty soy sauce, although that might have been its name digging its way into my brain. The flavours hung around with fruit leather, tannic grape skins, fruity dark chocolate woody spice, fruit leaves, and long lingering sticky berries. One that I’d love to revisit when I wasn’t sat inside on the hottest day of the year. Bruno was one of the brewers running around during the Speed Blogging session, pouring Surfing Hop, a beer that he described as being sort of like a Double IPA. 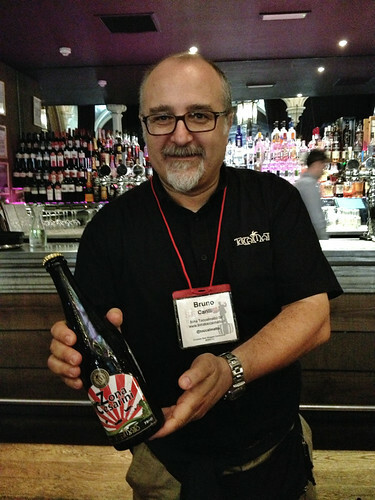 It was first produced in 2009, one of the first beers that the brewery released, and picked up a bunch of awards before they stopped entering their beers – Bruno’s not a fan of commercialism and didn’t like the way awards were going, a sentiment that’s popped up a bit elsewhere in the booze world now that the IWSC awards have been announced. It’s a bit of mishmash, with American hops (Amarillo, Warrior and Summit) and beer making techniques, allied with a base of Belgian malt. On the nose there was lots of mulchy green hop and resin, with fruit hiding underneath the big green bitterness. To taste there’s a smack of rich, sweet, fruity malt, with bitter orange zest and sweet flesh. It finishes with dark roasted bitterness, fragrant hop and orange zest. A bit much for me, but definitely one for those who like their IPAs rich and intense. 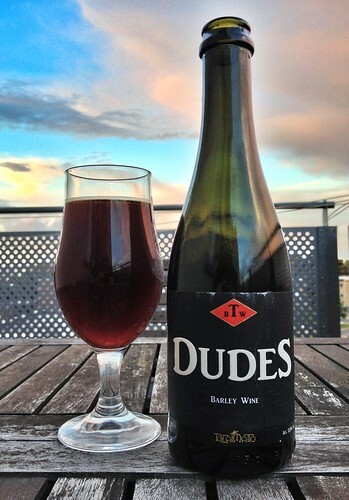 Last, but not least (especially in ABV), is the beer I brought home with me – Dudes. It’s a barley wine and Untappd specifically categorise it as an ‘English Barley Wine’, something that fits in with the brewery’s founding love of British beer as well as Belgian. It’s certainly a familiar beer, with a heavy nose of dates, Eccles cake filling, Marmite and a touch of soured red fruit. To taste it’s thick and sweet, with some sourness cutting through the syrup and supporting some buttery icing. It’s also got a bit of the ‘maybe a bit too much’ ashiness that I sometimes find in bottled beers that I’ve opened at the wrong time in their maturation cycle – this has a BBE of April 2026, so I might have caught it at a less than top point in its life. It finishes initially with a light sweetness, but coffee and dark chocolate pile in to help stop it from being cloying. Sour fruit and coffee grounds hang around for a while, with some rich umami-ness clinging to the tongue. Heavy and worryingly drinkable, it’s a perfect example of the things that Toccalmatto seem to be doing from the small range of beers I’ve tried. Italian beer is so often seen as light and bubbly, the perfect fodder for a warm day, but that’s not all they have up their sleeves. These four are all big beers that will happily chill down and keep you cool, but will also keep you warm when the nights draw in. I just wish I’d managed to grab a taste of their beautifully presented, wine cask aged, wild brett fermented Imperial Russian Stout, which disappeared rather quickly after it was opened. It was rather warm outside though, and I suspect I would have just fallen asleep if I had. Anyway, I look forward to seeing more of Bruno’s beers in the UK and suspect that Fidenza may be on the itinerary if my plans to eat and drink tasty things in Italy come to fruition. Whisky barrel aged barley wine, 12%.